Nissan Europe has launched two new models, the New Murano and the New Qashqai+2, with a visual effects-laden set of television commercials, showing the vehicles in a dancing contest. 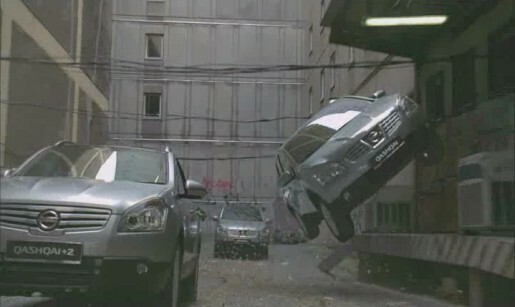 The television advertising campaign presents the Murano and Qashqai as two city gangs, each expressing their unique personality. The Murano comes from the upscale part of the city while Qashqai and Qashqai +2 come from the more gritty areas. Murano is refined and imposing while Qashqai is quick and agile. These two gangs like to challenge each other but as they both own the city, they also share similar values and respect each other. They will settle their differences through a dance battle where each of their moves reflect their respective attitude and personality before ending in a beautifully choreographed finale inspired from classic American musicals. Nissan Europe staff were marketing communications general manager Jean-Pierre Diernaz, advertising and media manager Caroline Mechai, and advertising section manager Lisette Nieuwenhuis. The Urban Playground campaign was developed at TBWA\G1 and TBWA\Paris by executive creative director Erik Vervroegen, European creative director Parag Tembulkar, executive managing director Ewan Veitch, art director Marianne Fonferrier, copywriter Chislaine De Germon, head of TV Maxime Boiron, TV producer Virginie Chalard, head of sound Alexandre Fay Keller, sound producer Benoit Dunaigre, account director Guillaume Chupeau, account manager Céline Duval, account executive Raphaël Bouquillon, planning director Filippo Dell’Osso. Filming was shot in Berlin over five days by Frederick Planchon via Irene, Paris, with producer Christine Guibaudeau. Post production was done over two months at BUF, Paris, under the leadership of producer Laurent Seigneur and 3D supervisor Maxime Delorme.